Looney Tunes Being Made Again! A recent article from the NYT says that the Looney Tunes, including classic cartoon and comedy characters Bugs Bunny, Daffy Duck, Porky Pig, and Coyote/Roadrunner, will start production again. The good news is that it won’t be Loonatics, or Baby Bugs, or any of the half-dozen cockamammie ideas they’ve had in the past to capitalize on the brand. Instead, they are going back to a relatively classic formula– a half hour show will be 3 6 minute shorts plus 2 2 minute Merrie Melodies. They’re making 26 of these! They’ll also be making some 3-d coyote/roadrunner shorts for film release. 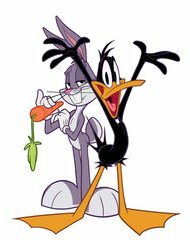 There will be a contemporary element that I fully expect to grouse about later–Daffy and Bugs will be room-mates in this show– but I understand that they feel the need to contextualize. For my money, they just need to go back to making stuff that will make people laugh, and no one will care whose turn it is to take out the garbage. Jay Stewart in the Tribeca Citizen Slinging the Soap.